With the recently released (or rather "re-released", see below) mobile application Autodesk 360 you can interactively view and discuss virtually any 2D and 3D CAD format file on the screen of your iPad or iPhone. The "Autodesk 360" cloud service offers many useful CAD functions and cloud tools, and much more new enhancements are planned for coming months (see our blog post). Functions of the new, project-based Autodesk 360, including the interactive viewer of any of the 60 different CAD formats, are available through a web browser. But there were performance limits imposed by mobile web browsers like Safari or Chrome - especially WebGL limits. The new mobile application Autodesk A360 circumvents these limits by accessing the cloud data and functions directly, not through a mobile web browser. Autodesk A360 Mobile is currently available for iOS only - i.e. for iPads and iPhones (Android version is planned). Autodesk A360 allows to view even huge 3D and 2D designs and tracks what's happening on your projects. Through the app, you will be able to connect and collaborate with your teams, from wherever your work takes you. All the data is accessible and easily viewable in a wide variety of formats. Autodesk 360 enables both online and offline workflows - it will help you become more productive by dramatically improving the way you design, visualize, simulate, and share your work. Some of the CAD formats supported in Autodesk A360: AutoCAD, Inventor, Fusion 360, Revit, Navisworks, SolidWorks, CATIA or generic file formats like PDF, DWF/DWFX, STL, STEP, IGES, OBJ, SAT and much more. 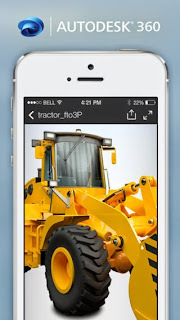 You can download the new Autodesk A360 (free) from iTunes and since Oct also from Google Play. Although the name "Autodesk 360" is appropriate for such tool, there already was an application called "Autodesk 360" (aka "Design Review Mobile"). This app is still available for Android. So don't be confused by the version numbering - in fact "Autodesk 360 V1.0 for iOS" is a brand new tool with much more functions than the "previous" version 3.x of the older app named "Autodesk 360". Update: the application is now named "A360 Mobile". Very shortly after the announcement of the NEi NASTRAN acquisition, Autodesk has added this newly acquired technology to its standard product offering. Subscription customers of Autodesk Simulation Mechanical 2015 can now download a "product enhancement" from their Subscription Center account. 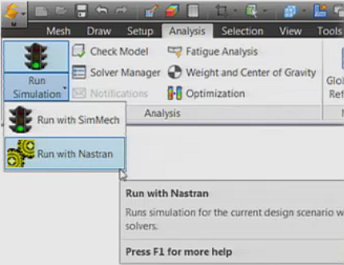 This download adds the Autodesk Nastran industry proven solver to Simulation Mechanical 2015, improving the accuracy and robustness of the simulation process.